Back in September 2013 I wrote a blog about my wife’s great uncle by marriage, Wilfred Welch Piper. He was once featured in a Cornish newspaper as a leading draughts player in that south west county of England. A chap called John Gillbard came across that piece of mine and got in touch. 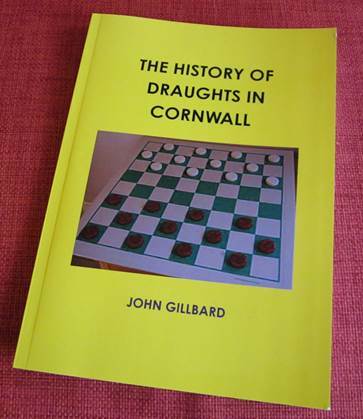 John was writing a book on the history of draughts in Cornwall and wondered if we had any more. The answer was a big yes, for we had Wilfred’ scrapbook in which he had kept many news items about draughts players and matches in Cornwall. John has now finished his book and has kindly sent us a copy. The book covers the period from the 1800s to 2015. John’s view is that the game is now in its death throes as far as being a truly competitive activity is concerned. That’s a shame, of course, but younger people do tend to like to have a screen in front of them and maybe a bit of action in their games. I’m pleased to say that my wife’s relatives do appear in the book. Locksands Life is pleased to have helped bring about this book which offers insight into a little facet of West Country history. This entry was posted on April 28, 2015 at 5:19 am and is filed under Genealogy, misc, past times. You can follow any responses to this entry through the RSS 2.0 feed. You can leave a response, or trackback from your own site.